Variable rewards are the third element of the hook formula. Rewards will build up motivation to return to your product and use it again. Reward your users to improve engagement and make them love your product. These rewards are driven by our connectedness with other people. We feel rewarded when we feel accepted, attractive, important, and included. Example: likes on Facebook. These rewards are based on gaining resources or information. If we add an element of uncertainty, it will increase the power of the reward. Example: machine gambling. 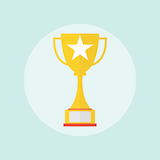 These rewards are fueled by intrinsic motivation to gain competency, completion, or mastery. This means that we feel rewarded when we do something that we feel competent doing, when we complete things, or when we are growing. Examples: Leveling up in a game or assembling puzzles.